…we even laid out a little bit. But two EXTREMELY cool things happened this day. 1. Noah won a beautiful sapphire and diamond necklace in a drawing! It was at one of those incredibly long infomercial things on the ship, that I honestly didn’t want to go to but Noah insisted upon. It’s so pretty, and I think it might be worth some money! 2. Noah placed third in the Hairy Chest Competition. Ok, Noah’s friends and family have always made fun of him because he is really really hairy, and we’ve always said that he was going to enter the competition on the cruise if we had a chance. Last time we went, we were busy with something, but this time he did it! So he gets up on stage with the nine other guys that entered, and lo and behold, who is one of his judges? HIS BEST FRIEND’S MOTHER. We knew she was on the trip (it was just a coincidence that we were both there), but in no way did we plan on her doing that! But hey, if you’ve got an inside track, why not use it? 🙂 He had to dance in front of the judges, do a Tarzan call, and swim in the pool in front of a whole lot of people / shake off like a dog. I have never laughed so hard in my life. He only placed third, but it was because the other two guys had big groups with them that cheered louder than just little old me 🙂 We probably had 40 people come up to us for the rest of the trip, first asking “Hey aren’t you the hairy chest guy?” and then telling us that he should have won and they cheered for him. It was so beyond funny! He is SO hairier than the other guys. The guy on the left won. Noah and his friend’s mother. His only award for placing third. 🙁 The winner only got a t-shirt though. We had our first formal dinner this night too. It was DELICIOUS…lobster tails! Probably the best meal of the trip. The ship captain at the captain’s cocktail. Warm chocolate melting cake. Seriously the best thing I have ever eaten in. my. life. I planned on putting Key West in this post, but it turned out to be really long…I had no idea how much we did that day! I’ll post about that tomorrow. In comparison to all of that, today has been incredibly boring. I made an AWESOME casserole from a recipe I found on Kelly’s Recipe Site (not only did I design it, but I love the recipes too! 🙂 It’s a Mexican chicken casserole, and was just delicious! I found a recipe for Spanish rice here, and it all turned out so great! Have yet to tackle that vacation laundry pile. It’s clean, but still sitting in my laundry room. See? Maybe when I’ve got Noah out of the house tomorrow I can do it. I love him, but I can’t get ANYTHING done when he’s home…I turn into a procrastinator! 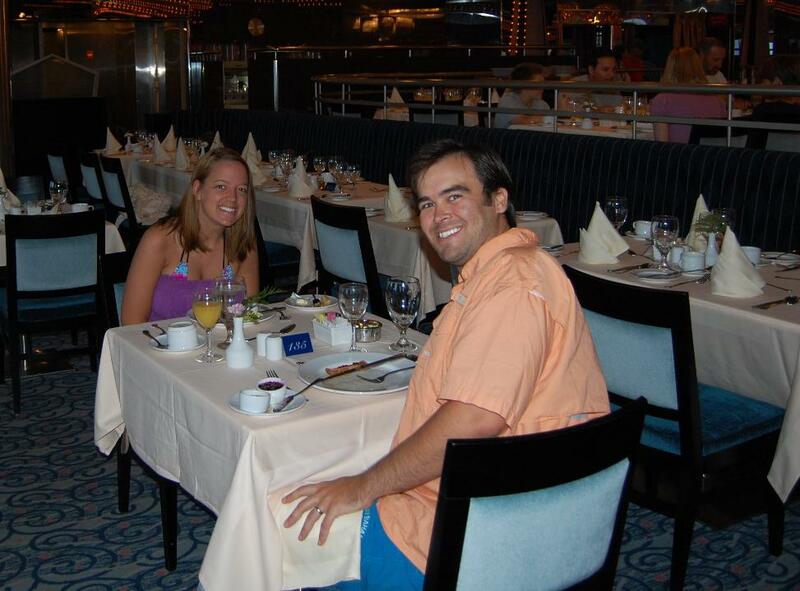 PS – I came across this today…this happened on the same cruise ship we took, taking the same route (New Orleans to Key West and Nassau). Apparently a high school senior fell over the railing on the boat and they can’t find them. I remember the water being VERY deep at this point in the trip (like 10,000 feet), so being out there by yourself sounds just terrifying. Please say a prayer tonight for him and his family/friends if you get a chance!